Joanna Vaiou is a Search Engine Optimization Specialist from Greece at her own SEO company helping established brands in high end industries (architecture, construction, automotive etc) with their overall organic web presence and rankings in Google owned marketing channels like: Google Universal, YouTube, Google my Business, etc. I dived into the internet marketing word 10 years ago in 2009. I am self-taught and a self-starter. The internet in general was an unknown area to me back then. My Bachelor degree was in Financial studies and the jobs that I did (for a while each) up to then, had no relation with the digital μαρκετινγ world. I started learning online (on YouTube and with other free and paid courses, how to build my own websites on Wordrpress platform. My aim was το build skills in a professional major that would allow me to work from home within the next the following years, start my own business (become my own boss) and become free to travel (and work online simultaneously). I have a very analytical mind combined with a creative thinking attribute. This is the right combination for someone to become a Search Engine Optimizer. After I learned how to build WordPress websites, I had to learn how to promote them so they get traffic. When I ran into SEO as a digital marketing method, I was hooked. That was it. I knew it was for me. Never looked back since then. I fell in love with learning SEO and building a skill set that would allow me to live my freedom (lap-top) lifestyle. I never enjoyed being an employee, the commuting back and forth, the restrictions of having to be in standard place every day, with the same people, with no freedom to travel whenever I liked and little-to no chance for professional development (at the level I wanted it for myself, money-wise). – Found something that I loved and was passionate about: I can’t even lay stress on how important passion and love is for what one does, in order to be successful! – Spent 3 years at home studying alone (with no mentor), building the necessary skills. – Spent 1 year working as an SEO Director at an internet marketing agency in my city (one of the best in Europe) where I learned how to deal with high levels of pressure. – Four years later, I started my own business and working from home! I was invited to give an in-house SEO & Digital Marketing workshop for educational reasons to C-level executives that lasted 2-3 hours. I remember my PowerPoint presentation was 100 pages. When the workshop ended, I was asked to make them an offer to work together so I can handle all the SEO & other digital marketing aspects for the company. I have a total of 10 years of activity online with my own website and Social Media Profiles. At the point where I am at now as we speak, I do SEO and I am active on social media where I share helpful resources for my audience in terms of SEO: Niche SEO case studies, SEO industry news, how-to articles, tips, videos, etc. In my ten years of experience, I have met and worked with many people, clients and partners who are truly happy and satisfied from our work together. As a result, I get many referrals and I have found that it is a great source to build a business. Word of mouth marketing is super powerful and it does not require extra work from what one already does. When I keep improving myself as a person and a professional, my partners and clients will benefit more from me and as a result, I get rewarded with more referrals: It takes two to tango. My most productive hours are never in the early morning, nor I am a morning type. My usual day starts in peace around 10am. I need 8 hours of sleep because my mind needs these hours to rest. My brain activity is very intense while I am awake. When I sleep at night, I rest and recharge my mind so it can continue to support me the following day as well. I have my coffee, open my lap top and I start working. I usually work at home and when I don’t, I choose a nice lap-top & work-friendly cafe – restaurant to spend my most productive hours and have everything I need to fuel my thoughts in order to become actionable strategies for my clients and other projects. I remember myself when I started (mentor-less) being under a lot of pressure (imposed by me and my self-expectations). I was afraid that I would not make it, everything seemed so difficult. Growth and change is painful. But the most painful situation in my eyes is REGRET. I can’t think of something more sad than regret. What I didn’t exactly know when I started and I know now is that: I am enough. I am all the people and have all the qualities I I need, in order to change and improve my life. This is the reason why my first investments were in Personal Development. I knew that building a professional skill set wouldn’t be enough. I had to build a new self and improve my mindset in order to win the life I wanted for myself. Without Personal Development, I wouldn’t have made it online. – Find something that you really enjoy doing and are truly passionate for. If you don’t fall in love with what you do, you will not have the strength to make it emotionally, psychologically during the hard and difficult days. It is not easy to become an online entrepreneur, work from home and be successful while doing it. – You will need to be highly self disciplined because you will need to take a 100% responsibility for your own self in every area. There will be no steady paychecks in the end of the month. – Having a great relationship with yourself and finding happiness and peace with yourself alone, will take you a long way ahead from your peers who always need to be in crowds of people, in order to feel they are doing something. Online entrepreneurship is a lonely road and this is why there are so many more employees that there are entrepreneurs. Invest in yourself to build your character, personality and soft skills in order to become the appropriate person who deserves the life you dream for yourself. and all your inner qualities, then guess what… You are right again! 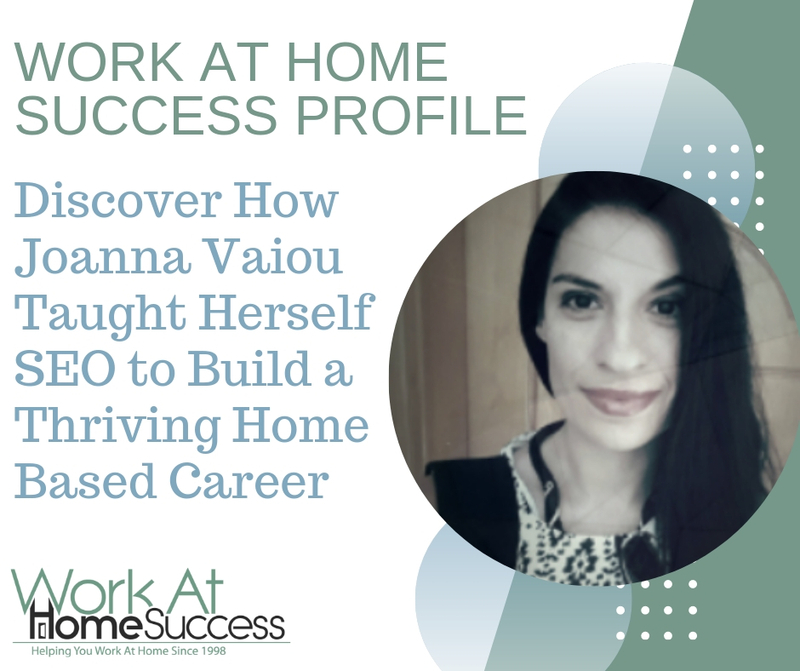 Check out more profiles of people just like you that turned their talents, passions, and interested into a work-at-home career. Are you a Work-At-Home Success?